Undergo unique ancient health treatments based off 40,000 years of Aboriginal culture that use the Aussie bush as a pharmacy. Australia’s Aboriginal culture has a few years on the clock; some argue as many as 75,000, others “only” 40,000. Either way, the Aboriginal culture and its healing techniques are probably the oldest in the world. Drawing on the bush, the landscape, traditional foods and spirituality, Indigenous medicine and practices create a holistic approach to healing. In 2007 the Yothu Yindi Foundation – an Indigenous not-for-profit organisation – set up Dilthan Yolngunha (The Healing Place) in Gulkula in northeast Arnhem Land. Dilthan Yolngunha is a pioneering community respite and rehabilitation centre, with senior Aboriginal women using traditional healing techniques to care for people with a wide range of ailments, including depression, substance abuse and cancer. In a unique venture to help finance its vital community service and to share this traditional knowledge, The Healing Place will open its doors in 2008 to outsiders by offering a three-day Healing Experience Program for any women interested in experiencing, benefitting from and learning about these ancient medicines in a culturally unique setting. 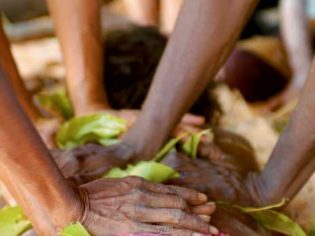 This is a truly distinctive opportunity to learn from traditional herbalists and masseurs about the world’s oldest pharmacy – the Aussie bush – and the local Yolngu culture. You certainly won’t find this kind of ancient advice anywhere else in the world. On Aboriginal land 30min drive from Nhulunbuy on the Gove Peninsula, Arnhem Land. www.healingplace.com.au. Avoidance relationships exist in Yolngu culture, as in many Aboriginal groups, where certain people can’t speak or look at one another. The main two are son-in-law/mother-in-law and brother/sister.